One of the most potent myths of our age is that the Crusades were little more than an unprovoked attack by a barbarous Europe against a quiescent and cultured Islamic world. According to conventional ideas, the seventh and eighth centuries constitute the great age of Islamic expansion. By the eleventh century — the time of the First Crusade — we are told that the Islamic world was quiescent and settled and that, by implication, the Crusaders were the aggressors. Indeed, the Crusaders are routinely portrayed as a horde of barbarians from a backward and superstitious Europe irrupting into the cultured and urbane world of the eleventh century Near East. This at least is the populist language often employed on television and in newspaper articles. In my recent book Holy Warriors: Islam and the Demise of Classical Civilization, I have shown however that before the advent of Islam Christians had no concept of “Holy War” at all, and that it was from the Muslims themselves that Europeans took this idea. I showed too that the Crusades, far from being an unprovoked act of aggression on the part of Christian Europe, was part of a rearguard action aimed at stemming the Muslim advance which, by the start of the eleventh century, was threatening as never before to overwhelm the whole of Europe. With what justification, we might ask, does Bull dissociate the earlier Christian-Muslim conflicts of the eleventh century in Spain, Sicily, and Anatolia from the First Crusade? The answer can hardly be described as convincing. “There is plenty of evidence,” he says, “to suggest that people regarded Pope Urban II’s crusade appeal of 1095-6 as something of a shock to the communal system: it was felt to be effective precisely because it was different from anything attempted before.” (Ibid) Of course it was different: the Pope had called a meeting of all the potentates and prelates of Europe to urge the assembly of a mighty force to march to Constantinople and eventually to retake the Holy Land. It was new because of its scale and its ambition. But to thus dismiss the connection with what went before in Spain and Sicily — and Anatolia — is ridiculous. Such a statement can only derive from a mindset which somehow has to see the Crusaders as the aggressors and to thereby detach them from the legitimate defensive wars which Christians had been fighting in Spain and throughout the Mediterranean in the decades immediately preceding 1095. The fact is, in the twenty years before the First Crusade, Christendom had lost the whole of Anatolia, an area greater than France, and a region right on the doorstep of Europe. In 1050 the Seljuk leader Togrul Beg undertook Holy War against the Christians of Anatolia, who had thus far resisted the power of the Caliphs. We are told that 130,000 Christians died in the war, but that, upon Togrul Beg’s death in 1063 the Christians reasserted their independence and freedom. This was however to be of short duration, and no sooner had Togrul Beg’s nephew Alp Arslan been proclaimed Sultan than the war was renewed. In 1064 the old Armenian capital of Ani was destroyed; and the prince of Kars, the last independent Armenian ruler, “gladly handed over his lands to the [Byzantine] Emperor in return for estates in the Taurus mountains. Large numbers of Armenians accompanied him to his new home.” (Steven Runciman, The History of the Crusades Vol. 1 (Cambridge, 1951) p.61) Indeed, at this time, the entire Armenian nation was effectively transplanted hundreds of miles to the south and west. These events make it perfectly clear that the Turks now threatened all the of Empire’s Asiatic possessions, with the position of Constantinople herself increasingly insecure. The imperial government was forced to take action. Constantine X, whose neglect of the army was largely responsible for the catastrophes which now overwhelmed the Empire, had died in 1067, leaving a young son, Michael VII under the regency of the Empress-mother Eudocia. Next year Eudocia married the commander-in-chief, Romanus Diogenes, who was raised to the throne. Romanus was a distinguished soldier and a sincere patriot, who saw that the safety of the Empire depended on the rebuilding of the army and ultimately the reconquest of Armenia. (Ibid.) Within four months of his accession, Romanus had gathered together a large but unreliable force and set out to meet the foe. “In three laborious campaigns,” writes Gibbon, “the Turks were driven beyond the Euphrates; in the fourth, and last, Romanus undertook the deliverance of Armenia.” (Decline and Fall, Ch. 57) Here however, at the seminal battle of Manzikert (1071), he was defeated and captured and all of Anatolia was irretrievably lost. We see in the above a graphic example of the disinformation disseminated by the mentality of political correctness, where the victim is transformed into the aggressor and the aggressor portrayed as the victim. Alp Arslan was killed a year later, and the conquest of Asia Minor, virtually all that was left of Byzantium’s Asiatic possessions, was completed by his son Malek Shah (1074 — 1084). These conquests left the Turks in possession of the fortress of Nicaea, on the southern shore of the Sea of Marmara, and the survival of Constantinople in question. The ordinary peasants of Europe may not have been fully cognizant of the danger from the east, but the ruling classes and the Church could not have been anything but alarmed. Yet even if the peasantry and artisans of Europe knew little about Anatolia, they would certainly have had some knowledge of the Muslim threat. It is Marcus Bull’s suggestion that they did not which is untenable. The advances of Abd er-Rahman III and Al-Mansur through northern Spain in the latter years of the tenth century would have sent a flood of Christian refugees into southern France; and the raids even into southern France which continued well into the eleventh century would have sent refugees from there fleeing into central and northern France. These people would have spread knowledge of the danger throughout western Europe. Granted, peasants and manual laborers would have had a very imperfect understanding of Islam and what Muslims actually believed; but that is not the point: They knew enough to know that Muslims were enemies of Christ; that they waged war against non-combatants and enslaved women and children, and that they had conquered all of Spain and threatened France. And this is a point that needs to be stressed repeatedly: The reality is that, far from being quiescent and peaceful, by the latter years of the tenth century Islam was once again on the march. 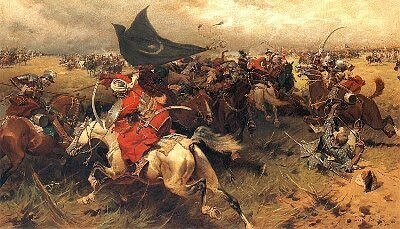 Muslim armies waged wars of conquest against non-believers from one end of the Islamic world to the other; from Spain in the west to India in the east; and this new aggression was not confined to the eastern and western extremities, but proceeded along the entire length of Islam’s borders. The Christian kingdoms of Armenia, Georgia and Byzantium were threatened with extinction, and Muslim armies fought with Christians in Sicily and other Mediterranean lands. Many aspects of this new Islamic thrust, particularly those which occurred around the beginning of the eleventh century in Spain and India, are strangely reminiscent of the earlier Islamic expansion in the eighth century, so reminiscent indeed that they might even cause the casual observer to wonder whether the birth of Islam has been somehow misdated and moved into the past by several centuries. So, for example, we are told that the main Islamic invasion of India began with the conquests of Mahmud of Ghazni, a Turkish-speaking prince based in Afghanistan, who launched a series of 17 campaigns into Northern India. These began in 1001 and ended in 1026, just four years or so before his death; a series of campaigns, we should note, which caused immense destruction and loss of life in the country. By the 1020s Mahmud ruled an empire that included much of the Indus Valley, Afghanistan and Persia. Yet these conquests, at the start of the eleventh century, seem to echo those of Muhammed bin Qasim, three centuries earlier, who created an Islamic Empire in roughly the same region (circa 710). It is strange too that Mahmud of Ghazni’s name differs but little from that of his predecessor. Only the “n” in Ghazni differentiates it from Qasim, a word which could equally well be written as Qasmi. It was the attacks of Al-Mansur that finally roused Christian Europe into undertaking the Reconquista, which commenced with the campaigns of Sancho III (called the Great) of Navarre and the Norman Baron Roger de Tony in the 1020s. Yet these events recall the earlier beginning of the Reconquista with the victory of Don Pelayo at Covadonga around 718. The reader might well wonder why this “revival” of Islamic conquest in the eleventh century seems so uncannily to resemble the Islamic conquests of the seventh and eighth centuries. That indeed is a moot point: one to be discussed in a future article. For the moment, all that needs to be emphasized is that, contrary to popular belief, the tenth and eleventh centuries constitute a period of massive expansion by Islam, an expansion felt all along Islam’s boundary with Christendom. The Crusades were clearly part of an attempt to stem this aggression.